Workman Publishing Company, 9781523502134, 192pp. Unicorn Food is the food trend redefining clean eating, with plant-based dishes that are as bewitchingly beautiful and Instagrammable as they are nourishing and delicious. Now, in a kaleidoscope of 75 innovative, naturally colorful recipes, food journalist Kat Odell—author of Day Drinking and entrepreneur behind the alt-milk brand Unicorn Foods—introduces healthy, vibrant dishes that are as fun to eat as they are good for you. The ingredients are all natural and nutrient packed, ranging from fresh fruits and vegetables to superfoods like flax seeds, coconut oil, spirulina, chia, and bee pollen. And the hyper-colorful, creative recipes are perfect for healthy-forward eaters, including gently flavored nut milks, grain bowls loaded with fresh vegetables, probiotic breakfast custards, toasts with slathers and spreads. This is health food filled with joy, and in all the colors of the rainbow: the deep glowing yellow of a Frozen Turmeric Lassi, the greens of Bean Thread Noodle Salad with Miso-Arugula Pesto, the intense oranges and purples of Sweet + Sour Rainbow Radish Tacos, the tie-dye rainbow effect of Pineapple Kimchi Summer Sunset Rolls, and the pastels of Strawberry-Pink Peppercorn "Ice Cream" Sticks. 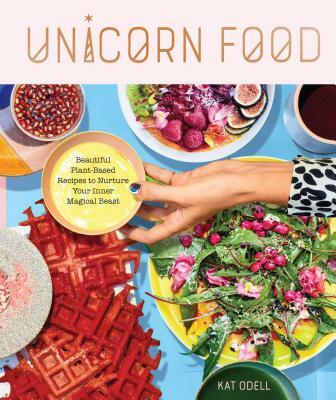 Filled with dazzling full-color photographs, and published in a package as special as the dishes themselves, Unicorn Food is a cookbook of real beauty, in the look, in the recipes, in the spirit of the food itself. Kat Odell is a food journalist and the entrepreneur behind the plant-based food and drink brand Unicorn Foods. Odell was the editor of Eater L.A. for five years and the editor of Eater Drinks for the last two years. She has been published in Vogue, New York Times T Magazine, Food & Wine, Condé Nast Traveler, and Bon Appétit, among others. She has also made appearances as a judge and expert at a variety of food-related events, and her first book, Day Drinking, came out in spring 2017. Kate Odell and Unicorn Food can be found at @kat_odell and @unicornfoods.